Congrats on new car, when do you pick up? Go for it. I'd guess a local place with one in stock would let you offer it up to see how it looks and whether it catches on anything. According to the blurb it has both angular and vertical adjustment. LED conversion. Oh. My. God. It’s literally like night and day, and arguably the most cost-effective improvement I’ve made on the car so far. Couple it with the 4-main beam modification, and the result is truly astonishing! I recommend that if you’re going to convert, you don’t buy cheap LEDs. I bought from https://www.classiccarleds.co.uk/ superb quality kit. Hey guys! Ive just picked up a rough 1980 esprit and figured I should start a thread here to post pictures and ask questions. The car has sat outside for a long while and most of the interior is ruined. The paint is tired but it does the trick for me right now- its a beautiful car and I cant wait to drive it! The odometer reads 9000, and the car was apperently repossessed in 1983 after which the engine was either replaced or rebuilt- I'm not sure which. I dont trust the odometer ,however, as the door hinges are incredibly worn and the tires have been replaced with several different brands. I got the engine to run on an external gas tank the day I got it, so the carbs and engine are decent. I just finished rebuilding the diaphragm fuel pump and it seems to work great, so the next step is replacing the terrible plastic clutch line with something less cracked. The alternator bracket is also cracked and I can see where it was welded in a different place in the past, is this a common failure? Also, I have what appears to have once been a cardstock glove box with fuse panels attached to one side, was this stock? If so, does anyone have a diagram or pictures of how these wires connect to the fuse panels? The service manual that came with the car looks like it is for a later model and isnt very helpful... Thanks for any help! Edit: looking at the pictures now, I can see I should have taken some while the car is dry... I'll post some new ones when I get the chance! So the Riviera. Had chance to go view it today for the first time in a couple of years and I must say it is still looking good.Probably because its stored in a nice dry, damp free shed along with a host of other vehicles. I explained before why it is now up for sale, but here are the pics I have taken today. On the rear nearside quarter there are two star cracks caused by something moving about in the boot, there is a little bit of damage to the front spoiler on the nearside where it caught a high kerb, on the scuttle panel below the windscreen on the right hand side a bit of paint has peeled off, the paint is otherwise all original, there are minor stone chips on the front valance, the interior is spotless for her age with the original crash pad on the steering wheel to match the interior. The original storage bag for the lift out roof section is still in the boot along with the tool kit etc. The car has had quick wash down to remove storage dust so that I could see the condition of the paint and other than what I have mentioned, it's pretty good and nothing that a good polish wouldn't cure. The engine is obviously in very good condition having been rebuilt just a few years ago by a local specialist race car builder. The car is for sale at a fixed price of £7500 which will include the private registration plate which I checked on various web sites and is valued at £500.00. Hi team. My name is Josh and I’m based on Brisbane, QLD. 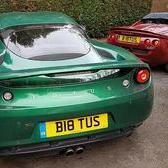 My dad Paul has brought me up around lotus (a series 1 Elise, series 2 Elise and now an evora). Has been a goal to one day pick one up and that time is here! I’ve just picked up (in feb) a 04 111R in black and it’s been a dream come true! These cars are seriously epic, the power is plenty! Needed some love, still﻿﻿﻿﻿ does a little but getting there. Keen for a little bit of track/sprint stuff but mainly weekend twisties. You’ll definitely find me on Nebo/glorious most weekends. Looking forward to meeting more Elise nuts @111Ratt - my lotus files. @driverscircle - my car photography. [eBay]2017 Evora -- olid Yellow Evora 400 with 2919 Miles WE FINANCE! Very nice! I really like your colour choice. I just want to sanity check my plans before I spend my day tomorrow removing my old four pots and more importantly, getting rid of them. Right now I have Lotus spec AP 4 pot on 308mm fronts and standard Brembo rear on 295mm rotors. It's clear to me that the braking is not right - I guess too front biased, which means they lock fairly easily and the car dives a lot under braking. I far prefer the braking of a friends car with standard brakes and upgraded discs, although that's still not perfect, especially in the wet. I found the BOE article suggesting the Elise works well with a ~55% static front bias, so I've picked up some lotus motorsport rear callipers with 38mm pistons. (Standard rears are 36, standard 2 pots are 44) I plan to remove my 4 pots, and put the original 2 pots on the front. According to a basic static bias calculator, this would give me 59% front bias. 57.5% if I stick 308mm rotors on the rear as well. 4 pots front and the old 2 pots rear would give 56% front with the same size rotor, but would that require a master cylinder upgrade? Has anyone tried it? Am I missing anything else that the four pots are offering me, though? Does anyone else run with 2 pot front and rear? Obviously, ideally, I want to be running a balance bar pedal box, but I've yet to settle on anything to do that yet, so I'm just looking for a short term win initially. A man of good taste I specced my GT4 in Mexico blue and Riviera was a close second. 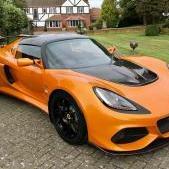 That REALLY suits an Exige and if I was speccing would be exactly how I’d do it. Well done sir! Ps anyone else who’s speccing a 430 / 410 acid green would also look epic. If I was in his position, I would not consider webers. choise 1 : the search for a dellorto . Should be possible choise 2 : convert it to trottle bodies and a modern progra:mmable ecu with lambda. That should convert the 912 in an even, more refined engine, with good starting and running in all condition. [eBay]2010 Lotus Evora 2+2 2010 LOTUS EVORA 2+2 26K MILES RARE! ISOTOPE GREEN CLEAN AUTO HISTORY REPORT LR!